According to The Beatles, "It was 20 years ago today, Sgt. Pepper taught the band to play." That's not all that happened 20 years ago. In 1983 something known as RFC 1883 was published. It dealt with "Internet Protocol, Version 6 (IPv6)." That was two decades ago. But IPv6's time has come...slowly, but surely. IPv6, the new-but-not-so-new IP address format, is the wave of the foreseeable future for all of us and our Internet connections—but as of January 2016, only 10 percent of Internet users are connected to the Internet through an IPv6 address. Are you? Check WhatIsMyIPAddress.com to find out. Only 10 percent? It's a start. On December 26, 2015, the world (all Internet users globally) reached 9.98-percent IPv6 deployment. That's a moderate increase from just the 6-percent figure from the year before. The United States is coming along fairly well, with an estimated 25 percent of users having access to an IPv6 connection. Belgium leads the entire world with 43 percent. Canada and South America, as well as other countries in Europe, have gone green over the past year or two. If a country's IPv6 deployment numbers didn't hit 1 percent, it stayed white. 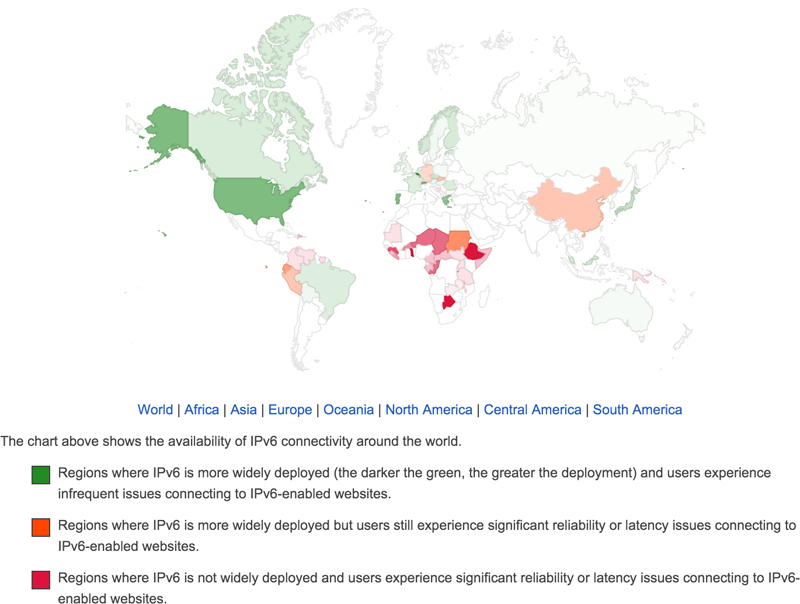 Countries on the map that are red or orange—China, as well as some African countries—have less than 1-percent access to IPv6. Users in those countries, according to one source, probably experience a worse connection than IPv4 (the current protocol) users do. It's important to know that a current IPv4 protocol/version address and an IPv6 address don't perform any differently as far as users are concerned—a connection is a connection. What matters to the world (especially to technology companies and Internet Service Providers in particular) is that there aren't any more new IPv4 addresses to assign to computer users, as well as to the millions of devices that aren't computers (such as scanners) that need them. The supply has been exhausted. IPv6 will fix all that...eventually. There will be plenty of those addresses for all time. It went up to 0.4 percent at the end of 2011. It hit 1 percent toward the end of 2012. It reached 2.5 percent as 2013 wound down. It climbed to 6 percent at the end of 2014 (which was a good increase). Finally, it made it to the 10% deployment mark by the end of 2015. Sure, it seems that there's nowhere for those numbers to go but up, but it's still not likely to zoom up so fast. The 90 percent of computer users who don't have (access to) IPv6 connectivity—whoever and wherever they are—might be using the tried-and-true protocol a bit longer. More accurately, any corporation or technology company that needs a significant number of IP addresses to make things happen (in the hundreds of thousands) or to allot to employees or customers is plain out of luck. Even the technology giant Microsoft was caught flat-footed when North America's IPv4 supply was dwindling. Microsoft had to spend millions of dollars buying up unused IPv4 addresses from other corporations! Look at it this way: If a new cable company came on the scene and wanted to connect millions of new customers, they would have to set them up with IPv6 addresses. And that means they'd have to make sure their entire network infrastructure was IPv6-ready—and their customers would need to be up to speed too, connectivity-wise. As it turns out, networking experts have devised ways to slowly introduce IPv6 in a way that allows it to work with IPv4 simultaneously—but that's not an ideal or long-term solution. And it's definitely not the future. The sending computer would need to create an IPv6-compatible data packet. All the routers along the way (and any firewalls and load balancers) would need to be able to look at and understand the IPv6 packet to be able to send it on its way. The receiving computer would need to be able to understand the IPv6 packet and decipher the information it contains. The applications between senders and receivers (for example, between your browser and a website) would also need to know how to spot and work with IPv6 addresses. There would likely have to be an IPv6 upgrade (or replacement) of all servers, clients, routers, firewalls, load balancers and management systems. If along the way just one device fumbled with the IPv6 protocol—or an IT administrator simply hadn't enabled it—the connection would fail. You can understand why corporations and ISPs everywhere simply waited to see what was going to happen when that day arrived, when IPv4 addresses would all be gone. Taking all of the above into account, it's fairly amazing that 10 percent of Google users were actually able to connect with the protocol of the future...as it celebrated its 20th birthday.